The future of veterinary education and how it should adapt to meet our changing expectations of vets is currently the subject of much discussion. 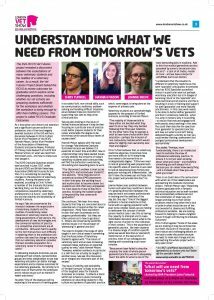 I interviewed the three members of a panel on the topic at the recent London Vet Show for this article which appeared in the show’s newspaper. Their different perspectives are interesting and highlight the importance of the RCVS Graduate Outcomes project, which has been tasked to explore issues, including the skills and competences required of future veterinary professionals, the viability and desirability of limited licensure, the behaviours and skills required of veterinary graduates and how the undergraduate course might be structured in the future. The day-to-day pressures under which many of our vets and vet nurses work and the consequences they can suffer are well-documented. With the situation only likely to get tougher post-Brexit, it’s great to see the profession talking openly about the changes needed to ensure that it can offer future veterinary graduates a rewarding and satisfying career.